A couple of weeks ago I promised you all a peek at this new book. It's called Classic Country by Kathryn M. Ireland. Kathryn designs beautiful fabrics and this book is mainly a display of the many ways her fabrics have been used in different settings. I brought my iced tea out on a quilt in the backyard to enjoy the Fall day. :) Would you like some tea? I love the paisley fabric used on those roman shades below. I'm pretty sure that fabric would be perfect somewhere in my house. Hmmm...I bet BJ and Nancy would like it too! We could Flaunt Our Reds with this fabric. Here's a gorgeous bedroom to look at. Don't you love the look of two twin beds? I do. The sections in this book are separated by adorable colored drawings. Some people are so talented. Other people take pictures of the shadow of their head! You can't hear this but there are big thundering booms coming from behind the trees over there. Hopefully it will rain. A pretty dining room and staircase. This look timeless to me. Here's a gorgeous vignette we could all copy. Pretty fabrics. That big painting is too fancy for me but I love the symmetry of the display. I hope you enjoyed the little peek at this book. It's very pretty. Speaking of decorating books, have you ever checked the decorating section of your library? Mine has several very nice books. This book was a gift from my sweet son Spencer. Thanks for showing us this book. I wanted to run out and buy it when you first posted about it but haven't had the chance. That is one big paisley print!L~O~V~E IT! What a beautiful book!!! I could live in any of those gorgeous rooms!!! How fun...enjoying a favorite book outside!!! Thanks Stacey I'd love a glass of iced tea. It looks like a wonderful book. Each page you have shared with us is gorgeous!! If you get some rain can you send some here???? I'm ready again for our cool temperatures like last week!! Hope you have a wonderful day. Looks like a great book! The tip about the library is a great one--ours has a TON of decorating books. I've managed to see so many of the popular ones without paying. Have fun with your new gift--what a thoughtful son!! This looks like a library must have! it seems I could spend hours in a book like this. I got this book through a book club a while back, you have made me want to pull it out and look through it again. Yes, this is definitely a book I would pick up at the bookstore. I did not see this one before but I sure do like the pictures that you shared. How sweet of you son to choose a book so like how you decorate, to give to you. You trained him well. I am so impressed. Thanks for stopping by to see me. I appreciate your kind words. It is nice to know that people you've never met can be concerned and caring. I'm going to try to take your advise and give it another go. Thanks for sharing this pretty book..
O, I'm back...just looking at some of your back posts and saw where you made hot water cornbread...ummm..one of my favorite things to eat...and you didn't like it! What's wrong with ya, girl??? Are you sure you drowned it in buttah ????? thanks too, for coming by to visit. I do hope you will join us on the 3 projects challenge. Just keep it as a fun way to show us what you are doing. This book looks really good!! I find it harder and harder to find good quality decor books unless I order them on Amazon or from Borders. I suppose there are way too many to keep in stock, but what my bookstores and library have is terrible. Outdated. Hi Stacey! Thanks for sharing this lovely book with us! The rooms and fabrics are beautiful! How have I missed that book? Is the author the model Kathy Ireland? I'm jealous though - drinking tea -you know mine would be a Dr. Pepper, relaxing on that comfy quilt, listening to the pond and the sounds of nature...Calgon take me away! What a great book. It certainly contains some wonderful ideas! I would love to share a glass of tea with you! Have a great day! Oh...what a fun book to read. I too am a beliver in fabric. When ever we relocate and I need to decorate our new home...I mix an match all kinds of different prints of fabric. I am a big believer in window coverings and then from there I use a coordinating fabric for pillows, ottoman, placemates, dining room chair covers and table runners. I love, love fabric! What a great book. I love that you are taking the time to read a book... I hope you enjoy your day. What a fun visit with you and that fab book on your back porch! Just wanted to stop by to say thank you for coming by and taking a peek at my new autumn dishes...I sure enjoyed your sweet note, my friend!!! Ooooh...Classic Country looks like a fabulous book!!! I loved the style...looks like there are some great ideas there! Thanks for sharing it with us!!! I love the red paisley window shades...I love paisley patterns and of course I love the red!!! Ohhh...I loved that last photo too...the wall grouping is gorgeous!!! Well my friend...you should take up the "3 projects in 3 weeks" challenge! Girl, I'm the biggest procrastinator of all times...thought it might help me to get a few things done around here...committing...Oooh, I must do them now!!! Hehe!!! Happy Wednesday Stacey ~ Oh my, my...thank you for sharing a bit of such a wonderful book. I hope you get the rain you want too. This time of year is kind of the calm before the storm....and reading this book is a wonderfully calm way to spend this time. Great post! What a lovely present from your son. Thanks for showing it to us. Isn't it fun just to get lost in a beautiful book? Oooooh, I so love a good decorating book and may have to get this one! You red dining room is beautiful, but I totally understand wanting to change it. I didn't hate the red in my kitchen at all, it just didn't allow me to use a lot of red fabric/accessories because they didn't show up or were different shades and didn't look right. Wish we did live close so we could physically help each other will the work! That book is one that I will certainly pick up. The pics are so inspirational. You have fall weather, big sigh. Someday. Still hot as blazes here. I was looking at Amazon.com the other day. And trying to remember which book you were going to show us. But I came up empty. Thank goodness I waited until I knew for sure. Because I didn't think it was this one! It looks full of gorgeous eye candy! I am so happy you are going to participate in Doors of Welcome! And thank you for posting the button! I also want to thank you for posting that September is Ovarian Cancer Awareness month. I lost my Mom to this horrid disease, and we just soooo need for women to BE AWARE and question any changes in their bodies. Thanks again! 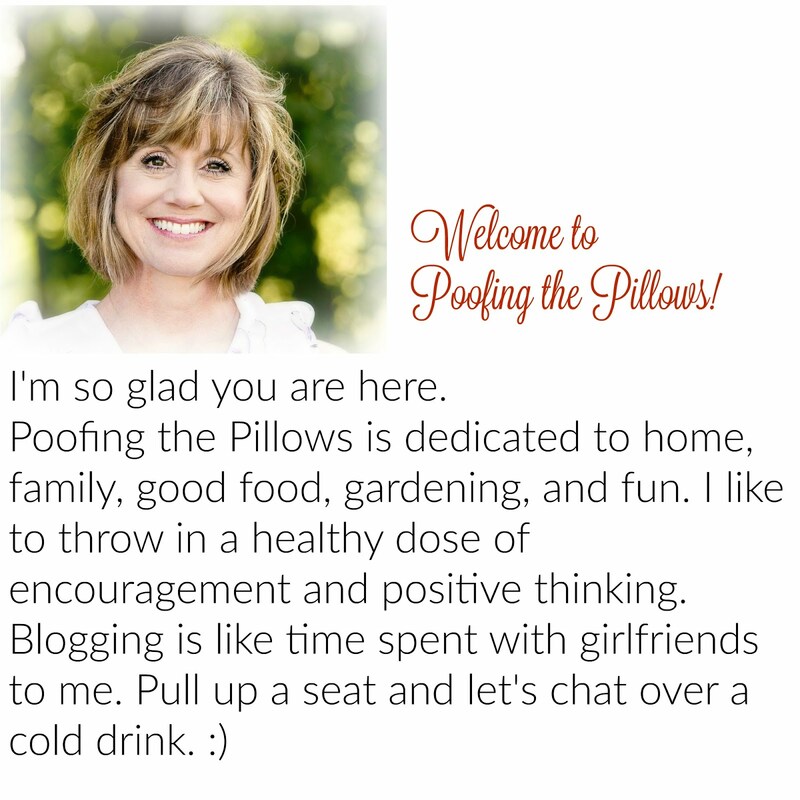 I'm so glad I found your blog! I'm following along now! YAY! Love the colors and settings in the book; I REALLY love the quilt peeking out from behind your book! I can hear the thunder from way down here in Texas, so bring on the rain. What a delightful gift from such a sweet son. What a joy to read / look at the book and think of a loving son.